a classic tavern brawl in Dingirra (act 2). The “throw chair” is a powerful attack! Don’t worry nothing big, only talking about a few extra months but I think is inevitable, as my games become bigger and more polished, I need to put more time into them. If I compare them with the ones I was making only 2-3 years ago, they all have custom tracks, custom backgrounds, higher art quality and more polishing in general. Also if you check other indies, they usually make 1 game a year, or max 2. So far I was still able to release at least 2-3 a year, and I believe of good quality. About SOTW: I made good progresses on the main plot, made a lot of battles in act 2 up to the point where you have a full party (with Riley and Krimm joining you). Battles with full parties are VERY different from the first act, that’s why balancing was hard: I was focusing on the wrong way, I needed to balance act 2 and then if necessary fix some act 1 battles. 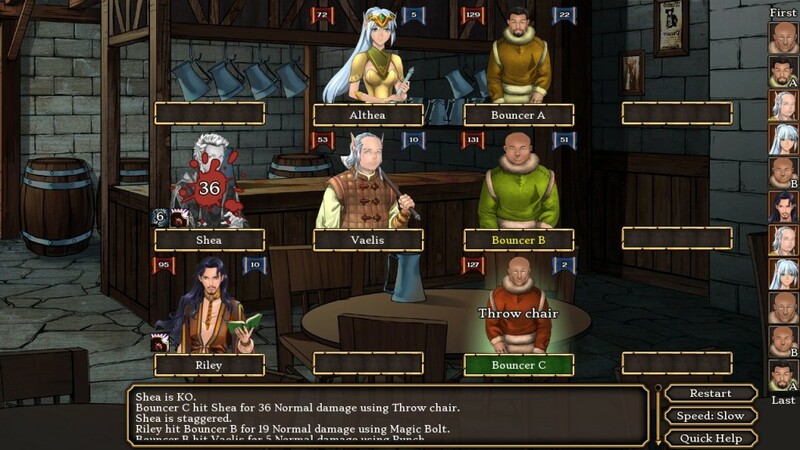 Since the game must be balanced with a full party, not with 3 party members (for those who didn’t play it yet, in the first act you can control only 3 characters). Vaelis and Rowinda background/personal quests are being added. The other romanceable characters already had them, but those two were missing. So Taleweaver (the game writer) is working on those. This won’t delay the game release since they can be unlocked in act 3, and independently from the main story. Nicole yuri and Planet Stronghold 2 writing is going on very slowly, but making progresses at least. This entry was posted in dating sims, development screenshot, nicole, planet stronghold 2, Roger Steel, roleplay games, Seasons Of The Wolf. Bookmark the permalink. 4 Responses to Good games takes time! Good afternoon, first I would like to congratulate them for the good games that you do and thank you also for having managed to put some of them through steam. Unfortunately i have a doubt about it, the games until the moment that have been passed Greenlich almost all released but still lack one, the Spirit Heart, I know you are busy and all, but could in a date or something when will be released? Spirited Heart should actually release tomorrow barring any mishap. I can personally guarantee there was work going on for it, though (testing to make sure the Steam version ran, trying to track down typos/grammar issues, and even a few bugs that cropped up). Some of the delay was also due to The Flowershop: Summer in Fairbrook passing Greenlight at the same time, not to mention his normal schedule of stuff such as working on Seasons of the Wolf. And I forgot to request the keys in advance for existing customers 😀 they’re on the way though!